not sure of the year, wondering if its a 94? where should everything be set? sound wise I love this amp! same deal with my last question, not one reply in weeks, this one has had 22 views and no one can explain this? - My mode switch in the back is set on "EX SW". - My EQ rocker switch in the front is set in the middle. - My loop rocker switch in the back is set down (to "FX Loop Switching"). With those settings, my footswitches work fine. I was going to post a reply, but you apparently don't want it. RTFM - you do have one, don't you? It's in there. And I'll second the grow up advice. Don't let the door hit you on the way out. it appears that my effects loop and my eq are both stuck "on"
When you switch the EQ on and off using the foot-switch, does the EQ LED on the amp go off and on? The 'effects loop' switches section of the manual can be somewhat confusing. Not only will the 'effects' rocker swith engage the loop, the loop can also be engaged via the 'lead' and 'R2' rocker switches next to the 'effects' switch. Check the 'lead' and 'r2' rocker switchs and make sure they are in the middle position. The 'down' position means the loop is active for that mode. Actually, the people on this forum are just fine, and would probably have posted up useful stuff in time. Except you had to start insulting everyone right on the first day you posted - what, did you expect instant answers? Yeah, right. Ok, I'll try this, but only expect to be insulted again. What you're up against is one of the big problems with these amps - the switching system. There are something like 43 vactrols that control the routing of the various signals, and they're somewhat prone to failure. And when they fail, odd things can result - most of the stuff will still work right, but just one thing will be odd. Sometimes you can live with the oddness, sometimes not so much. If you've set the switches as bgh suggested, and the footswitch isn't switching things but the lights are changing, then most likely one of the vactrols has blown. And you'll need to be dealing with mesa or a qualified tech to fix this - they're not user serviceable. Last edited by annaindat on Thu Jan 10, 2019 1:32 am, edited 3 times in total. 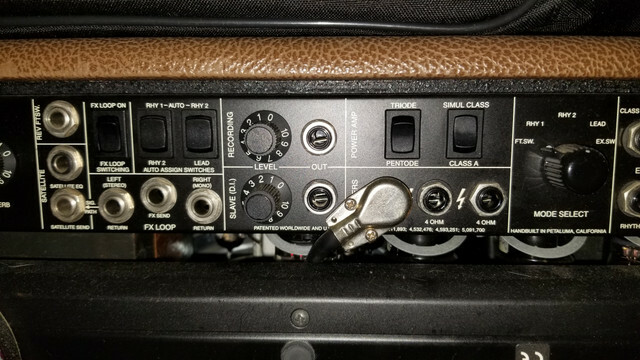 For the foot controller EQ switch to work this rocker must be set to OFF. Just in case someone can't follow directions, I'll post a picture. The two rocker switches labeled RHY 1 - AUTO - RHY 2 are three position switches. Make sure they are in the center postion!